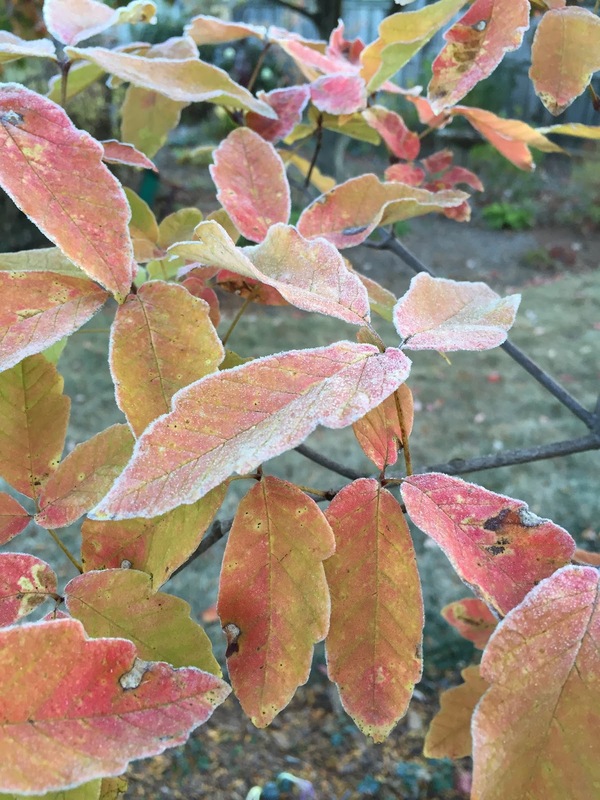 Frost tickled the garden yesterday morning and from what I could tell, very little seemed to be affected other than maybe the pepper plants in the vegetable garden, which were calling it quits anyway. 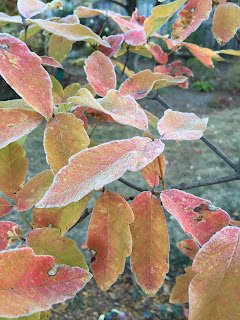 Then this morning the first freeze of the fall season slapped the garden upside nearly every plant that it could and the garden went down for the count and will not come back until next spring. For the most part. There are still some trees that haven't reached the peak of their fall color and many leaves have yet to fall. And there are still some blooms out there, but only on the hardiest of the hardy, including these Autumn crocuses I discovered yesterday. They are champs and I think I should plant many more in my garden. Later, the Christmas roses, Helleborus niger, will have buds and I'll make a big fuss over them, like I always do. I think there are now five planted throughout the garden, including the varieties 'Josef Lemper' and 'Potter's Wheel'. And of course, I'm watching those Camellia flower buds, checking their progress every few days. I did wonder earlier this morning when I surveyed the garden after that slap of freeze, if I should have covered them. I didn't, so if I should have, it is too late now. "The camellia year isn't going to be worth a thing this time, owing to that too - a dreadfully dry summer, the sudden cold whacked the buds - as doesn't ordinarily happen unless it gets much colder. However, those on the north of the house, oddly enough, are fine and full of buds - camellias are so temperamental." My camellias are on the north side of the house, too. And even though Welty grew her camellias in Jackson, Mississippi, in a climate they are much more suited to, her passing comment in a letter written 61 years ago gives me hope for my own camellias. So I'll keep checking them until I either see a bloom or see the buds turn brown. Rest assured, though, while I'm watching these last few buds, I won't just be standing around. There's no time for that. It's a new season now that we've had that tickle of frost and a slap of freeze, and I have a whole host of garden clean up tasks to attend to. I've got to pull this slapped-down garden up, dust it off, and get it ready for Spring, which is arriving in just 153 days. 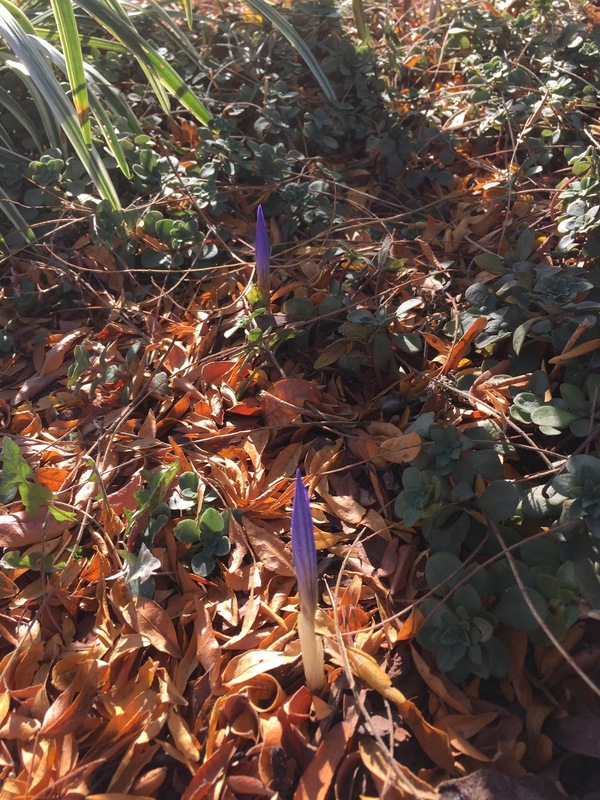 Yes, those autumn crocus are amazing. They bloom through December for me. Good luck with your camellia. I was hoping for a hard frost that would make clean-up easier, but alas, that did not happen here. And now it is going to warm up again. Oh yes, you can tell the frost and freeze has taken my garden down. I just need to get out there and start cleaning up. The weather this week will be perfect for that. I need more of those colchicums too. They look so delicate in the landscape. I will be curious to know if and when your camillias bloom. There is a person here in town that has them too. I should ask him if his have down alright the past few years. Sounds like the same weather as here in Massachusetts. That second day of cold really did everything in! I hope your camellias make it - camellias are so lovely! "and get it ready for Spring, which is arriving in just 153 days."